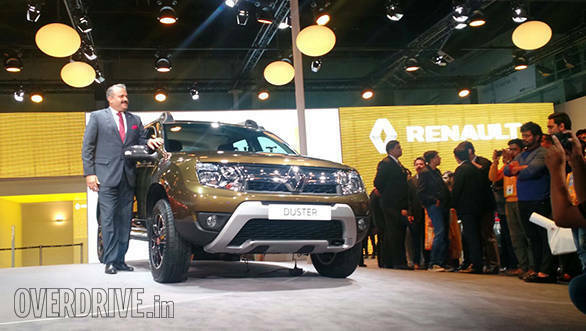 Renault unveiled the Duster facelift at the 2016 Auto Expo. The new version retains the overall design theme except for changes in the front which gets new headlights and a revised twin-slat chrome grille. The side gets new ORVMs with integrated turn indicators. Also seen on the model showcased at the Expo were new blackened alloy wheels which might make their way in to the production variant. It also gets LED tail lights in the rear along with a minor change in model and variant badging. The new Duster will retain the existing engine options. The 1.5-litre diesel will come in two states of tunes  85PS and 110PS. In addition to the manual transmission, Renault will also launch the Easy-R AMT variant of the Duster that was shown at the Auto Expo. The new Duster has an updated T4 electrical and electronics system and a new "CM010? engine compartment, which according to Renault, will improve safety. Automatic climate control, cruise control and updated media navigation system will be offered in the premium variant. Renault dealers have confirmed that the new Duster will arrive by the end of March 2016 and bookings will begin around the same time for an amount of Rs 50,000.